While the global electric vehicles industry is still at nascent state, it is poised to revolutionize industries and communities across the globe. Newmarket players are coming up with innovative technologies and entering the competitive arena of electric vehicles competing with strong automotive industry giants. With robust electric-vehicle technology, infrastructure is also becoming increasingly cost competitive and available which is the major factor that will drive the growth and adoption of electric heavy vehicles. Moreover, the degree to which heavy electric vehicles are adopted over time will depend on drops in their production costs, on the initiatives and policies that governments implement to encourage electric vehicles deployment, and on the magnitude to which electric heavy vehicle manufacturers agree to price electric vehicles attractively. In mid of rapid growth of electric vehicle sales, electric vehicle’s battery manufacturers are developing cost-effective batteries that have put electric vehicles on track to pass conventional vehicles. Such advancements and favorable government initiative will strengthen the growth of electric heavy vehicles over the forecast period. Goldstein Research analyst forecast global electric heavy vehicles market is likely to thrive with the emergence of new technologies and new market players with innovative products. Further, the electric heavy vehicles market is expected to expand at a CAGR of +40% over the forecast period as advancements in batteries and higher adoption rate will augment the growth of electric heavy vehicles sales. Based on types of technology, Goldstein Research predicts strong potential uptake of hybrid and plug-in hybrid technologies, in coming years. Heavy commercial electric vehicles presently have limited application and we anticipate that production of heavy commercial electric vehicles will be limited to a small niche market for the next decade. However, the plug-in hybrid vehicle segment is expected to be the fastest growing segment over the forecast period owing to its significant adoption in the U.S and European countries. Based on geography, Asia Pacific region dominated the global electric heavy vehicles market with about 45% market share of global electric heavy vehicles market with China as the growth engine for the electric heavy vehicles market in the region. On the other hand, United States is the fastest growing region for plug-in hybrid trucks market majorly fueled by the introduction of new electric heavy vehicles and the regional market value is expected to increase at a CAGR of +50% during the forecast period. The report covers the present ground scenario and the future growth prospects of the electric heavy vehicles for 2017-2025 along with the market players’ analysis. We calculated the market size and revenue share on the basis of revenue generated from major players in all major regions. Global electric heavy vehicles market is forecasted on the basis of revenue analysis, product benchmarking and strategic developments of key market players. Global Electric Heavy Vehicles Market Outlook 2017-2025, has been prepared based on an in-depth market analysis from industry experts. 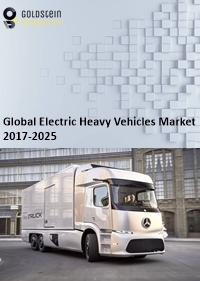 The report covers the competitive landscape and current position of major players in the global electric heavy vehicles market space. The report also includes Porter's five force model, SWOT analysis, company profiling, business strategies of market players and their business models. “Global Electric Heavy Vehicles Market Report” also recognizes value chain analysis to understand the cost differentiation, pricing models to provide a competitive advantage to the existing and new entry players. Our Global Electric Heavy Vehicles Market Report comprises of the following companies as the key players: Orange EV, Tesla, Hino Heavy Vehicles, Isuzu Motors Limited, Nissan, Goupil Industries, Dong Feng Motors, Iveco, Efficient Drivetrains Inc (EDI), BYD, Wrightspeed, Renault & Groupe Delanchy, Cummins Inc., Daimler AG and Nikola Motor Company.